Peterson Toscano » Scottish New Years–Hogmanay! Happy 2007 everyone. 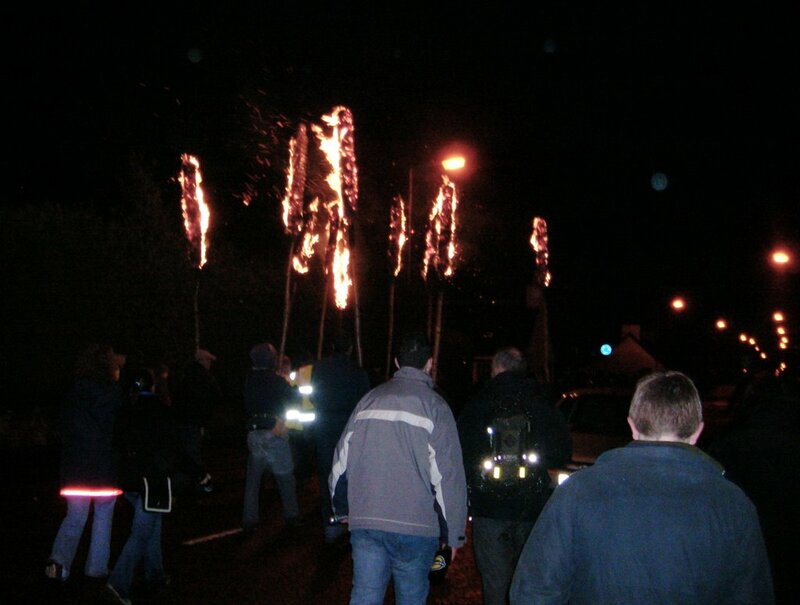 I know that it is not yet New Years in Connecticut where it is technically home for me, but here in Scotland, we have had a wonderful Hogmanay, as they call it. 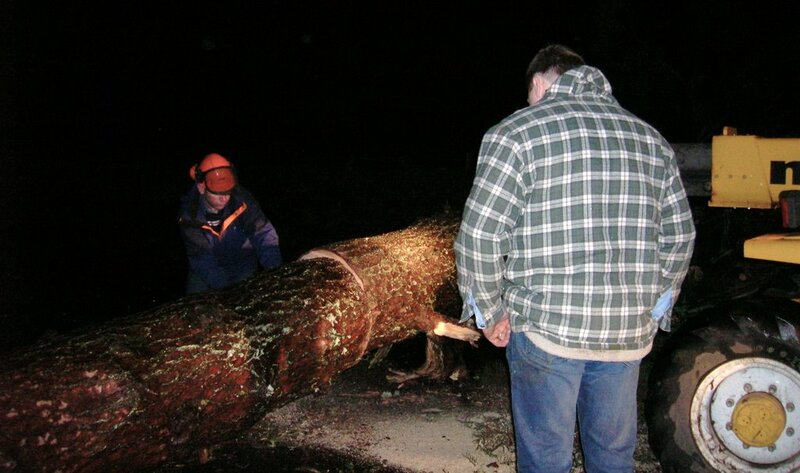 Because of high winds (up to 70 mph) and rain, they canceled Hogmanay celebrations in Edinburgh and Glasgow. In fact, they canceled celebrations in most towns and cities. I happened to have plans in Comrie, one of the ONLY cities to carry on. They have a special ceremony that goes back over 300 years. No one is sure of how it even started, but they call it a Flambeaux. 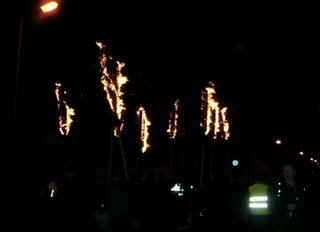 In order to drive out the evil spirits in the town, they light giant torches, parade through the four corners of the town with a bag pipe bag and the torches. 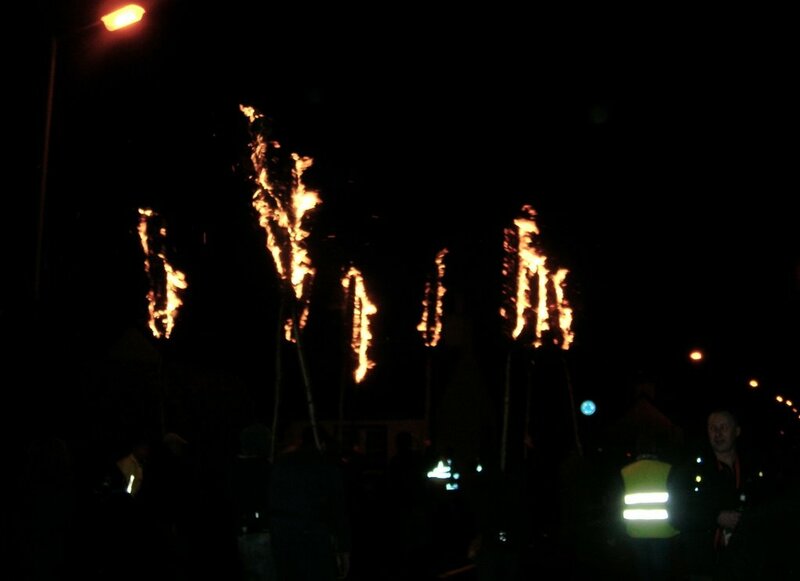 Then they toss the torches into the river. We nearly didn’t make it though because the wind blew down a huge tree on the little country road to the village. 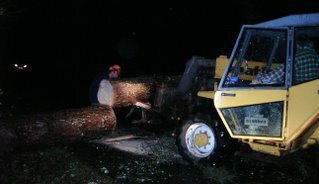 Fortunately two local men saved the day with their chainsaw and forklift. Very impressive. 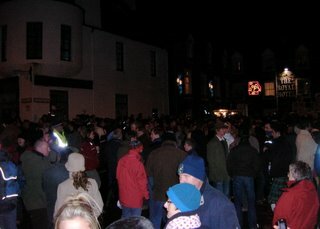 Comrie was GREAT with loads of people, many guys in kilts, and lots of fun. After that, we visited friends for first footing. For good luck you bring something to drink (whiskey is traditional), something to eat (shortbread) and something to keep warm (coal). I have some video I will try to get up in a day or two, but off to bed and then a hill walk tomorrow. 2006 was particularly difficult for me with deep personal losses within my family. But I have also made amazing friends and feel so much richer because of them. I look forward to this new year with new adventures, activism and opportunities. May 2007 be one filled with much love and peace and joy! Still waiting for the new year in Seattle. We’re close to being last on board. Seattle had its 70mph winds on 12/14. Three deaths due to falling trees, one due to drowning, and several more deaths over the next few days due to people runnig generators in their homes. A rather somber ending to the old year. Here’s to the new! Oh, I’m so jealous of you… it looks like you are having an awesome time while on holiday! Happy New Year’s to ya :)!! !